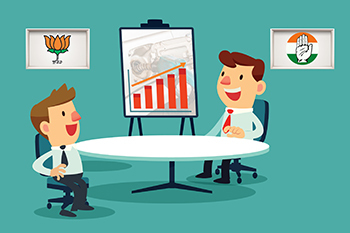 Congress used to put the oil price burden on the oil marketing companies like HPCL, BPCL, and IOCL. On the other hand, the BJP government follows free pricing. So the oil companies are not subsidizing but the costs are passed on to you. That is what capitalism is all about. Can you imagine a top journalist like Rajdeep Sardesai coming on prime time television and announcing, “Breaking News – There was no petrol price hike today”? With 12 consecutive price hikes in the last 12 days, that day may not really be far off. But jokes apart, Suresh Nair, a middle executive at a private firm, was in a really foul mood. Every time he would swipe his credit card at the petrol pump in the last few months for Rs1,000, he would get less petrol for his car. Suresh Nair lived in Ghatkopar and travelled to Andheri daily. With a fixed company travel allowance, fuel costs were the least of his concerns. But not any longer! The allowance was still fixed, but petrol prices were up sharply in the last 6 months. How was he going to manage this problem? That was when Suresh met his old stock broker friend Hetal Shah. Suresh: This is just too much. My company allowance is not sufficient to meet my monthly petrol expenses and I am actually going out of pocket. This is crazy; 12 petrol and diesel hikes in 12 days. This never happened when Congress was in power. Hetal: There is a fundamental difference. Congress used to put the oil price burden on the oil marketing companies like HPCL, BPCL and IOCL. On the other hand, the BJP government follows free pricing. So the oil companies are not subsidizing but the costs are passed on to you. That is what capitalism is all about. Suresh: Come on Hetal That is not the point. I am told that the cost of oil for the government is just Rs31/litre and we are paying Rs85/litre in Mumbai. Rest of the money goes as dealer margins, company profits and government excise. I have to pay for them all. BJP was quick to take away the lower oil prices by hiking excise duty 8 times. Now when prices are rising, should the government not give it back to us. I was really better off during the Congress era. Hetal: Ok, let us look at the positive side of it. All the money that the government is collecting is going to towards nation building. You are getting better roads, highways, freeways, world class ports and airports. At the end of the day, you will benefit from all these measures when the economy starts growing. One more point. Since the Modi government came and freed oil pricing, stocks like HPCL and BPCL have been multi-baggers. Had you bought these stocks in 2014, you would have made a small fortune. Suresh: That is the problem. I never invested in shares in 2014 and so I did not buy HPCL or BPCL back then. But today, I am paying higher prices for petrol and diesel. That is totally unfair. This kind of insensitivity never existed when Congress was in power. Even when the crude was at $140/bbl, the petrol and diesel prices in India were lower than it is today. Hetal: Now here is some good news for you Suresh. I just got a WhatsApp message that the BJP has decided to levy special cess on ONGC and OIL India to compensate for the higher prices. So, now you could actually get lower prices for your petrol. Suresh: (looking shell shocked) Don’t tell me that. Just 1 week back my broker advised me to buy ONGC shares and I am dead sure the prices of ONGC must have crashed. How can they just push the entire national burden on one company? By now Suresh had almost reconciled to the idea of leaving his car in the parking lot and taking the metro to office. A monthly metro pass would be substantially cheaper. End Note: Hetal needs to realize that not everybody will look at the broader macroeconomic aspects of everything. To most Indians, micros like prices and household budgets are what matters. Suresh also needs to realize that everything has a cost. It is just that some costs are palpable and some are not. Only last month, the doctor had warned Suresh of his rising hypertension levels and had suggested him to start walking. Probably, the fuel price hike was actually for Suresh’s own good.